Albert Hirschfeld (June 21, 1903 – January 20, 2003) was an American caricaturist best known for his black and white portraits of celebrities and Broadway stars. 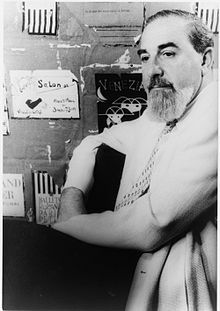 Al Hirschfeld was born in a two-story duplex at 1313 Carr Street in St. Louis, and later moved with his family to New York City, where he received his art training at the Art Students League of New York. Readers of The New York Times and other newspapers prior to the time they printed in color will be most familiar with the Hirschfeld drawings that are black ink on white illustration board. However, there is a whole body of Hirschfeld's work in color. 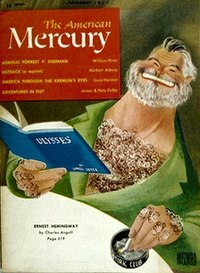 Hirschfeld's full-color paintings were commissioned by many magazines, often as the cover. Examples are TV Guide, Life Magazine, American Mercury, Look Magazine, The New York Times Magazine, The New Masses, and Seventeen Magazine. He also illustrated many books in color, most notably among them Harlem As Seen By Hirschfeld, with text by William Saroyan. Liza Minnelli, Minnelli on Minnelli, 1999. Hirschfeld drew the portrait in a single line. Hirschfeld is known for hiding Nina's name, written in capital letters ("NINA"), in most of the drawings he produced after her birth. The name would appear in a sleeve, in a hairdo, or somewhere in the background. As Margo Feiden described it, Hirschfeld engaged in the “harmless insanity,” as he called it, of hiding her name at least once in each of his drawings. [A] The number of NINAs concealed is shown by the number written to the right of his signature. Generally, if no number is to be found, either NINA appears once or the drawing was completed before she was born. ^ This practice has given rise to the term "nina", used by crossword puzzle writers and fans to refer to "a hidden message revealed in the completed grid of a crossword". ^ Besser, Joe (1985). Once a Stooge, Always a Stooge. Knightsbridge Publishing. p. 6. ISBN 1-877961-42-6. ^ Shepard, Richard F.; Gussow, Mel (January 21, 2003). "Al Hirschfeld, 99, Dies; He Drew Broadway". The New York Times. ^ "Louise Kerz and Al Hirschfeld". The New York Times (27 October 1996). New York. 27 October 1996. Retrieved 3 December 2016. ^ Hirschfeld, Al. "Al Hirschfeld.com". Any Drawing on the Website. Margo Feiden Galleries Ltd. Archived from the original on May 4, 2013. Retrieved April 25, 2013. ^ Hirschfeld, Al. "Al Hirschfeld's Early Color Portfolio". Hirschfeld's Early Color Portfolio. Margo Feiden Galleries Ltd. Retrieved April 25, 2013. ^ Brian, Greg. "The Fall of the TV Guide Empire". Yahoo!. Archived from the original on June 15, 2013. Retrieved April 25, 2013. ^ Hirschfeld, Al (1941). Harlem As Seen By Hirschfeld. New York: Hyperion Press. 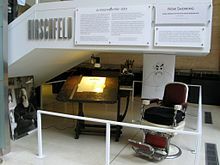 ^ Hirschfeld, Al. "Liza Minnelli, Minnelli on Minnelli". Liza Minnelli, Minnelli on Minnelli. Margo Feiden Galleries Ltd. Archived from the original on 2013-11-12. Retrieved May 23, 2013. ^ The Hirschfeld Century : Portrait of an artist and his age, edited and with text by David Leopold, Knopf, 2015. 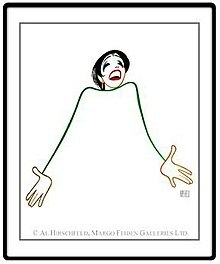 ^ "Al Hirschfeld/Margo Feiden Galleries Ltd". Alhirschfeld.com. Retrieved 2016-12-14. ^ Hirschfeld, Al (1970). The World of Hirschfeld. New York: Harry N. Abrams. ISBN 0810901773. ^ "St. Louis Walk of Fame Inductees". St. Louis Walk of Fame. Retrieved 25 April 2013. ^ "Lifetime Honors: National Medal of Arts". Nea.gov. 8 December 2003. Archived from the original on 8 December 2003. Retrieved 25 July 2017. ^ "New York Architecture Images-Salmagundi Club". Nyc-architecture.com. 1937-11-24. Retrieved 2016-12-14. 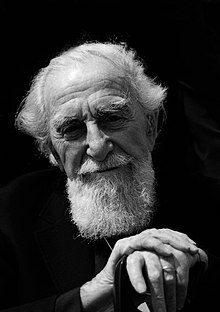 Wikimedia Commons has media related to Al Hirschfeld. The Line King's Library: Al Hirschfeld at The New York Public Library of Performing Arts Fall, 2013.